I think the phrase “rollercoaster of emotion” was invented specifically for this book. As I write these words, having just finished the book, I am a bit of an emotional wreck. I was given this book for free as part of World Book Night in 2011 and, although I had started it, I had never made it all the way through before. I’m not sure why not because it is brilliantly written and the characters are fantastic. The book follows the stories of four main characters, with a great cast of sub characters that drift in and out throughout the story. The first is Dina Dalal, a woman determined to make her way independently in the world in spite of the difficulties and family pressures she faces. The second are two tailors, gentle Ishvar and his sweet but a bit rebellious nephew Omprakash who move to the big city in hope of work and fleeing a brutal caste system in the countryside. And the final member of the quartet is a young student called Maneck sent by his parents from the hills to the city to study refrigeration. The lives of the four intertwine through the book and this unusual ‘family’ provides much of the fleeting joy in the book. It really sums up the book. You realise how whimsical the things that affect people’s lives can be. The book, set in Bombay during the Emergency called by Indira Gandhi, also captures how the corrupt nature of the government makes people at the lower ends of society so vulnerable, and the awful things that powerful people can do when there is nobody to stop them. Mistry clearly evokes life on the margins of society; the beggars and the street-sleepers, come alive in his hands. It is telling that one of the most likeable characters in the book is the beggarmaster who essentially is running a protection racket where people pay him in return for his ‘protection’. It is ridiculous that when he appears in the story you feel such a sense of relief that he can bring a measure of safety to the characters rather than feeling horror that they are having to pay to remain unmolested. The book centres around the four characters as the tailors work to fulfil orders for a clothing export company. This leads to lots of thread related metaphors and one of my favourite parts of the book was when they examine the quilt Dina has been making from scraps of cloth throughout the story and each piece of cloth relates to an experience they have all had together. Life’s rich tapestry brought to life. The book is particularly damning of the cruelty and unfairness of the caste system, the slum clearances and the government’s scheme to enforce birth control measures on an unwilling population. Indeed, Indira Gandhi gets a really bad press – the scenes in which Om and Ishvar are captured and taken to a political rally and ordered to cheer are funny but awful. The police are viewed as weak and impotent, the legal system a mockery. Against this precarious background the lives of our four characters teeter. The moments of joy and security feel incredibly precious. There is a moment, about 400 pages in that feels very much like a happy ending, and yet you know that because of the remaining 200 pages, this happiness can’t last. And it really doesn’t last. The final third of the book is brutal, shattering and painful as everything is unwound. As I read the final words, I looked up at E and said “We are very lucky”. 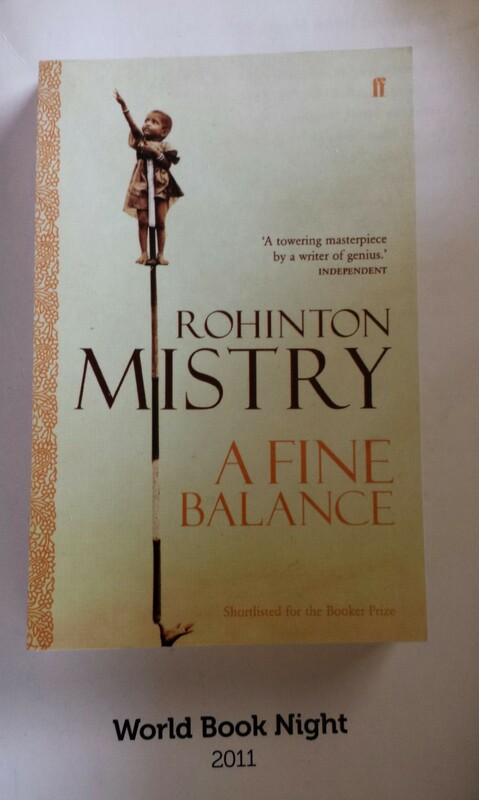 Tags: A fine balance, book, book review, books, caste, Gandhi, India, Rohinton Mistry, tailors, world book night. Bookmark the permalink. I’m also incredibly impressed at how quickly you read it! I agree it is pretty miserable, which may be why I gave up first time around. But, not long after the dog episode it does actually cheer up and is almost warm and cosy for a bit. That said, if you thought that it was miserable at the dog point, that is nothing compared to what happens in the last 200 pages. Misery upon misery. And it was worse, I think, because they had all had an interlude of happiness and hope. I’ve got a lot of very long books facing me in the next few months so I’m going to have to do some extreme speed reading, I fear! I loved this book. I read it over eight years ago, but the emotional impact has stayed with me. The characters are so vividly drawn and it is so beautifully written and that starkly contrasts with the stark brutality of the novel. I’ll definitely reread it at some point.